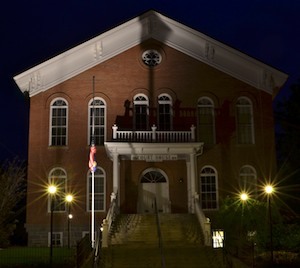 Virginia City Court House lit up at night. 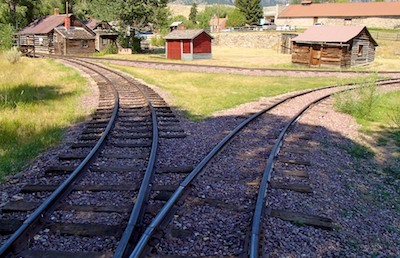 Early August, 2012 – The history of Dillon, Montana, a town built on a railroad spur that supplied Montana’s gold camps, intrigued us, but we found the heart of Montana’s history lies in the ghost town of Virginia City. Special effects on our buggy! 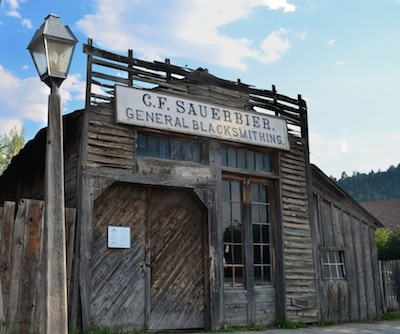 We had always thought that the 1850’s gold rush was all about California, but we learned that Montana played its part too, and Virginia City was at the center of it. Virginia City was also the spot where Mark took a lot of the photography reading he had been doing and began applying it. 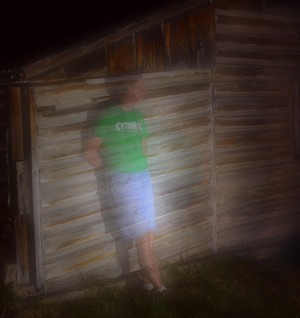 Suddenly some very interesting special effects started emerging from his camera. What a perfect place to try out all these techniques. 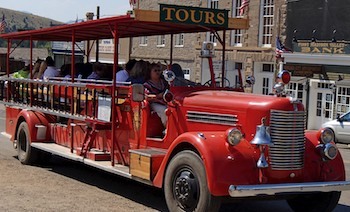 Nowadays Virginia City is a tourist town, and you can take a tour around town in a fire truck, a horse drawn carriage or an open-air, narrow gauge rail car. 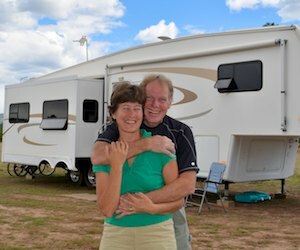 Just 132 full-time residents were living here at the time of the last census, and catering to tourists is a full-time job they all do very well. Back in the spring of 1863, however, there was nothing out here when nearby Alder Creek turned up some gold in its riverbed. Suddenly the rush was on. By that fall 10,000 people were scattered in the surrounding hills in a series of camps along the river’s edge in an area dubbed “Fourteen Mile City.” Most were gold miners from California and 30% or so were Chinese. Within a year, the Territory of Montana was carved out of the Territory of Idaho, and soon Virginia City was the capitol of Montana and its in-town population swelled to 10,000. In the next 25 years $90 million of gold (in 1880’s dollars) was removed. Gold was the one thing on everyone’s mind in those days, and the currency around town was gold dust valued at $16 to $18 an ounce. What a way to pay for a beer! 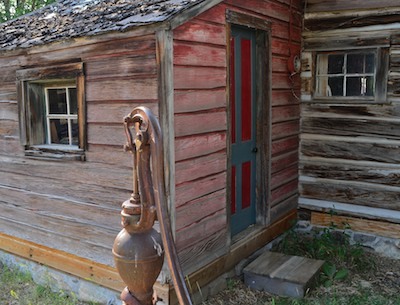 There are now 227 buildings in Virginia City, of which about 100 are historic. 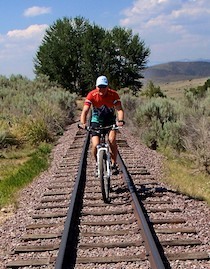 We rode our bikes around town and strolled down narrow alleys, enjoying the quirky sights of a bygone era. 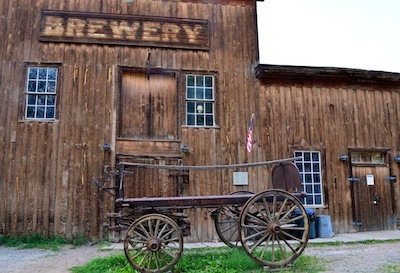 Virginia City is known for having one of the best collections of mid-nineteenth century commercial buildings, and of course Mark found the old Brewery right away. This place still sells beer, but it wasn’t open at the moment. 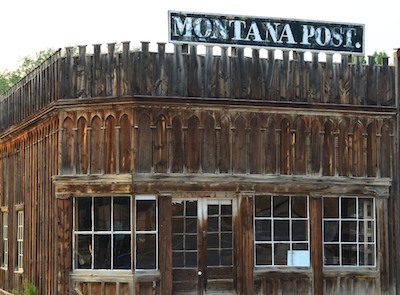 The Montana Post was the new capitol’s newspaper in the 1860’s, and its headquarters still stand today. 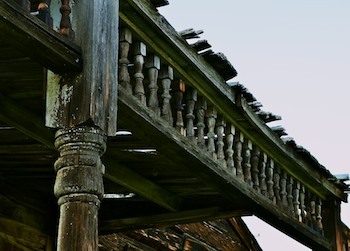 Rows of small homes line the back streets along the creek, and the wooden sidewalks with their wooden awnings evoke images of women in long dresses. 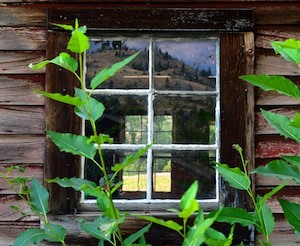 Oddly, if you peek in the open windows and doorways, there are still beds with moldy mattresses. We were told by one Virginia City worker that tourism workers used to live in these homes until fairly recently, and that one row of buildings used to be army barracks that were brought in as housing for the tourism workers. He told us the barracks were given a false old-fashioned western-style front to fit the town’s decor. This surprised us, because so many of the town’s buildings are authentic and original to this spot. 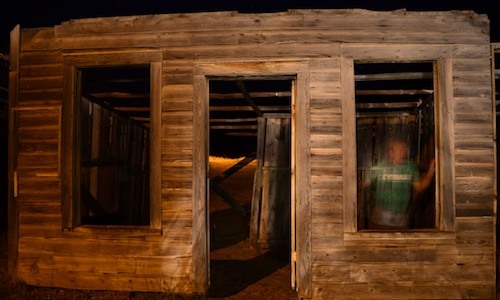 However, Virginia City has an unusual history. 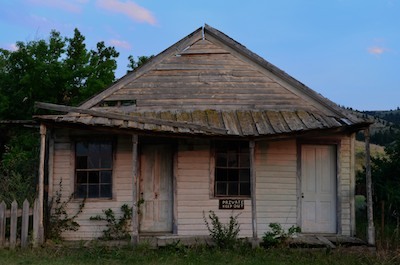 After its surge in the 1860’s — in 1866 it was the first Montana town to get a telegraph and that same year became the first Montana town to get a schoolhouse — the pursuit of gold soon took most of the townspeople away to better prospects. There was a huge gold strike at Lost Chance Gulch, which later became Helena, and it lured most gold miners away. 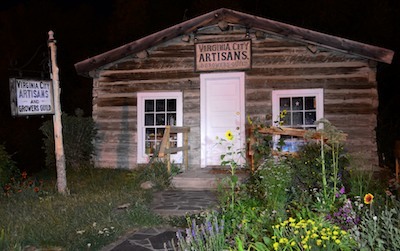 Although Virginia City became home to the administrative headquarters for Yellowstone when it was designated as America’s first National Park in 1872, and was also a favored staging area for folks getting outfitted for expeditions into Yellowstone, the vaulted title of State Capitol eventually went to Helena where it still remains. 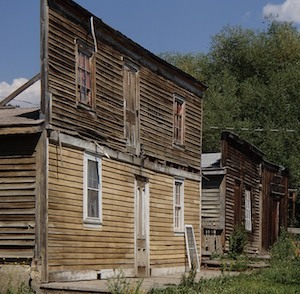 By 1875 Virginia City’s population had dwindled to 800 resident, leaving many of its 1200 buildings vacant. 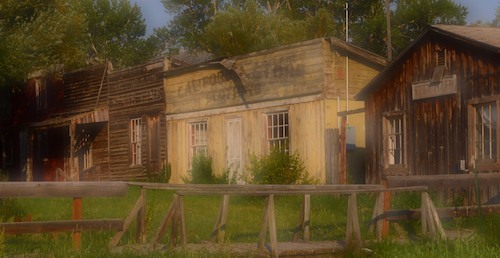 But the remains of these empty buildings are fascinating today, as they tell the story of the raw enthusiasm, energy and hopes that filled the American west during its years of greatest expansion. Everyone was in a hurry to get rich. 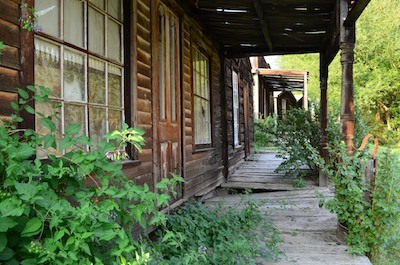 The buildings were thrown together to replace the tents that first housed the miners, and there was little care about the impact of mining on the environment. Huge pressurized water jets scoured the hills of everything, laying the rock and its gold bare. Enormous dredges floated downstream, chewing up everything in their path, including towns. Virginia City was spared this fate because it doesn’t sit directly on a gold vein, but nearby Nevada City and many others were swallowed up by the dredges. By the 1940’s nothing was happening in Virginia City, and Charles and Sue Bovey began buying the town’s buildings with an eye towards preservation and tourism. 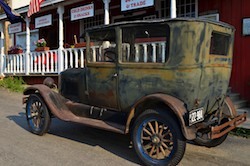 Virginia City already attracted a lot of curiosity seekers, and by bringing in and housing workers to run the old time shops and bars and dance hall, the Boveys created a town of living history for tourists. 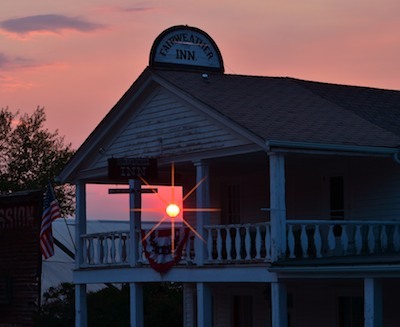 Virginia City was declared a National Landmark in 1961 and soon after was listed on the National Register of Historic Places. 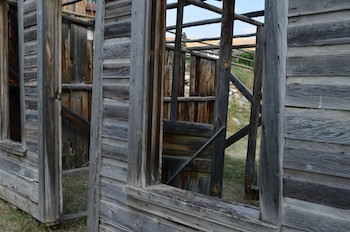 After Charles Bovey’s death the state of Montana began buying his buildings, and today Virginia City is a state operation. Just a few miles down the road lies Nevada City, a slightly different type of historic community, and during our stay in Virginia City we took a day trip over there to check it out. 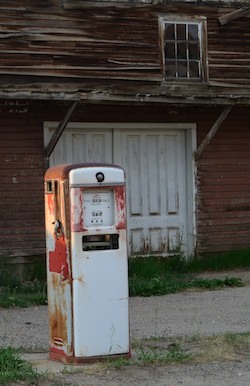 This entry was posted in Montana and tagged Ghost Towns, Montana, Travel, USA, WP Travel by Roads Less Traveled. Bookmark the permalink.